Yet another stop my boyfriend and I made this summer was Boston, Massachusetts. Knowing we only had one day in Boston, we went to visit the Freedom Trail. We were able to park pretty near our starting point near the visitor center by the U.S.S. Constitution. After seeing the big ol' ship, we started heading toward the Bunker Hill Monument. Although some of the 16 main sites on the Freedom Trail are spread out, it is easy to navigate to each by following the red bricks in the sidewalk which mark the trail. Periodically there are signs as well. I also followed along on Google Maps on my phone. So in July, I took a visit to Philadelphia, Pennsylvania. It was the first stop of our two and a half week trip through the northeast. We made parking reservations at a sort of random garage some blocks away from our main destination, Independence National Historic Park. There is a lot of history to check out at the historic park. We went to see the Liberty Bell, as well as Independence Hall. Before making our way, we had brought food to eat to avoid buying lunch, but I forgot a fork to eat it! While we were walking the streets of Philly, there are plenty of food vendors. Luckily, one of them was nice enough to give me a plastic fork without even making a purchase! Exploring D.C. in a Day! We went to Washington, D.C. as a day trip leaving out of Richmond, Virginia. It took a couple hours to get out there. Beforehand, we made parking reservations online to find the cheapest and most convenient location to park. This really took out a lot of hassle and probably saved money as well. The first stop was the White House. It was interesting to see the amount of security protecting the place. You'd think the president lives there or something! (Hah.) We didn't really do anything other than look at it, but it is possible to take a tour. Shifting Gears a Little . . .
Now that I've finished up blogging about Acadia, it's time to move on! I'm thinking that next I will do my experiences this summer in some major cities that I visited this summer for the first time. These would be Philadelphia, Washington, D.C., New York, and Boston. As I do not have video content for these, I will pair up Philly and D.C. into one video and NYC and Boston into a second video. I will make separate blog posts for each though. After that series, I will switch back to some hiking or something. For the long term, I applied to volunteer at Starved Rock State Park in Illinois. I applied a while ago and didn't hear anything, and just sent an email to them. Regardless of if I volunteer or not, I will make my way to Starved Rock at least a few times between now and next summer. I'm sure I can get some nice videos and blog material there. Anyway, the first city post will be up tomorrow! Finally, my video is finished and uploaded. Can you believe I left my computer on all night while it uploaded to YouTube and it still wasn't finished when I woke up? Anyway, I'll start on a new topic in the next couple days and I plan on having another video up this weekend. Subscribe to my YouTube channel please!. Could Have, Would Have, Should Have . . .
Now that I've basically chronicled everything I did during my two day Acadia trip, I thought I would mention some attractions and activities that I did not get to do. One thing that you could do would be to visit the towns surrounding Acadia. Bar Harbor in particular would have things for you to do, such as visit many shops and eat at a tasty sea food restaurant. There are numerous other small towns in the area. Visit some lighthouses.Bass Harbor Head Lighthouse is the easiest one to get to, as it is the only one actually on Mt. Desert Island. There are a couple more lighthouses located on the Cranberry Isles. With that said, you can visit the Cranberry Isles via ferry. You can also visit other islands that are not part of Acadia but are not far away, but some can only be accessed through charter tours. There are puffins on some of those islands, particularly Machias Seal Island. There are also numerous whale watching tours available in the area. One area that one must visit while in Acadia is the Ocean Path. It's 4.4 miles round trip from either Sand Beach or Otter Point, but you don't have walk the whole thing. You can see the main points by parking by Sand Beach and exploring there, then driving to Otter Point and doing your thing there. We didn't do that though. On the first day we were there, after setting up camp at Blackwoods, we drove to the Fabbri area from Otter Cliff Road to avoid getting on the Park Loop. We saw the Sand Beach area at a different time, as I wrote about in this post. Continuing on in Acadia, we visited The Jordan Pond House. The park's main gift shop and restaurant are located here. I bought a couple souvenirs here, as the shop was significantly larger than the one at the visitor center. We went there from the Beehive and Sand Beach, so we were looking for a bit easier hike to relax for a while. We hiked the Jordan Pond Path, which is a 3.2 mile loop around Jordan Pond. The Acadia hiking info site rates the Jordan Pond Path as a moderate hike, but it was definitely on the easier side. I made a silly video yesterday using a new video editing program, Magix Movie Edit Pro 2016. I also downloaded Debut Video Capture Software, which has some free features that Magix actually doesn't have (basically just screen capture). Anyhow, I just wanted to test it out and make an update on my YouTube channel with this video. Next I'll be making a video for Acadia to go with the posts I've been making. I still have a couple more Acadia posts as well. I'm hoping to have all of my Acadia stuff posted and done by the time I have to go back to work on Wednesday, 8/17. Before taking our trip to Acadia, we looked quite a bit at trails and what else we should go visit in the park. 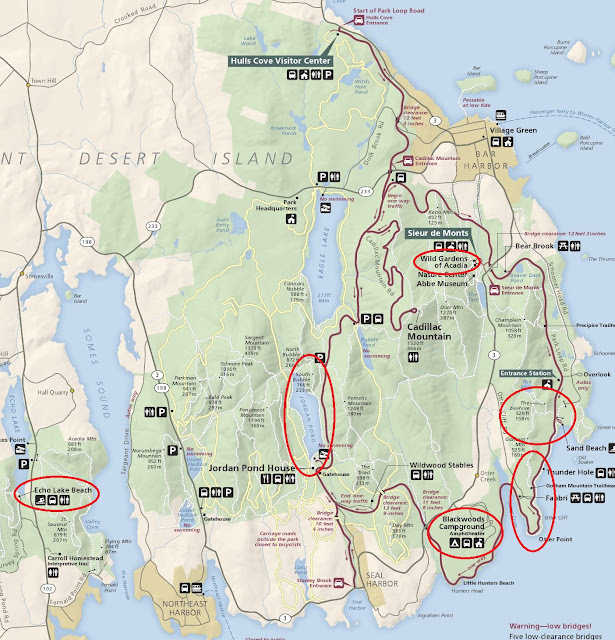 Again, see NPS Acadia hiking info from the Acadia website and Getting Around Acadia for reference. Two trails that really caught our eye were the Precipice Trail and the Beehive/Bowl Trails. Unfortunately, the Precipice Trail is closed during much of the summer due to the presence of endangered peregrine falcons. The Beehive Trail did not disappoint though. It has steep climbs, exposed cliffs, a narrow bridge, and iron rungs. Headed back toward the bottom, you can see people heading up the cliffs of the Beehive. Here's that bridge previously pictured. You can fall right off of that thing! Now to move on to the spots we visited in Acadia . . . Here's NPS Acadia hiking info from the Acadia website and you can refer to my last post to use for some reference. We ended up at Echo Lake as our first stop after visiting the Hulls Cover Visitor Center. The beach is pretty small but it appears to be the only lake swimming area in the park. We saw a few loons swimming around close, which was fun to watch. I'm mad because this is where my junk sports action camera randomly stopped working. I could have got some sweet underwater shots of the loons! Anyway, the beach has a lifeguard too. The water was chilly but definitely a better option than ocean swimming in the area as far as water temperature goes. The first hike we did in the park was up to Beech Cliff. This was an impromptu hike after visiting Echo Lake Beach and thinking, "Hey, let's go up there!" After visiting Provincetown (and Boston . . . I'll post about that another time), we headed toward Maine to one of the destinations that excited us most while planning our trip. Breakwater Walk, Cape Cod, and Provincetown! On July 13th, we visited Provincetown, Massachusetts. I will preface this by saying that we did not actually spend any time in the town! Instead, we were enchanted by the Breakwater Walk, which is a path made of boulders and stones leading through the water across to the outermost parts inside the Cape Cod Bay. We managed to find free parking, though I couldn't tell you which street it was on. It was only roughly ten minutes from the start of the path. The walk was a fun one. It took us about an hour to get across. The boulders are laid unevenly in many areas, so it does take a little bit of effort to make your way to the other side. Once we got to the end of the walk, we reached the sandy outer parts of the cape. Upon walking a little father, we came to a small lighthouse. It is the Wood End Lighthouse. It's a small lighthouse, but still worth wandering to. The Beginning of a Beautiful Trip . . .
From July 8th through July 24th of this year, my boyfriend and I went on a lovely road trip in the Northeast starting from Norfolk, VA where my boyfriend goes to school. Many of my coming posts and videos will be from that trip, since it is still fresh in my mind! I will not make posts in the same order the map goes though and may not make a post for every single post on that map. As for the map widget I used . . . It's kind of nifty, isn't it? I made it on Google My Maps. It's useful for making a map to show someone online such as how I used it in this post, but I wouldn't use it for much else other than a visual. My Maps is not very user-friendly in my opinion.